Possibilities. They’re virtually endless when you work with Networx Online. That’s because the telecommunications infrastructure that powers our products is our own. It’s proprietary. It’s powerful. It’s famously flexible. And it enables us to develop applications that fit the exact needs of our customers, with unmatched efficiency and reliability. Every Relationship Begins with a Connection. Relationship building is at the core of every direct sales and network marketing business. We facilitate that process by developing systems that connect tens of thousands of people across the globe, every day. But as every client knows, a system is only as good as the platform it’s running on. So how do we convince you that our infrastructure is the very best in the industry? By making you forget it’s even there. Fast loading websites. Crystal clear conference calls. Email deliverability that’s off the charts. Webinars that feel like a live event. Our telecom platform is built from the ground up with scalability, redundancy and uptime as top priorities. Hosted by a top-tier SAS 70 Type II compliant data center, our infrastructure is hardened through industry standard best practices and replicated across multiple cities to maximize uptime and reliability. Built with leading edge software, our proprietary systems distribute application load across multiple COTS servers allowing for easy scalability and redundancy. 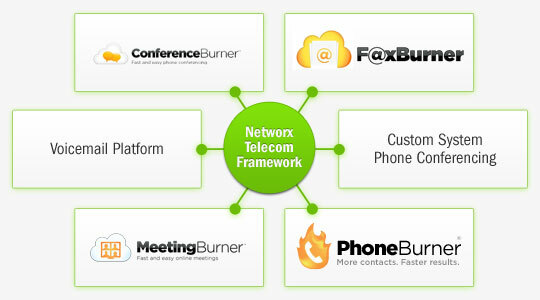 The flexible nature of our telecom framework is the heart and soul of our suite of products and services. The design architecture, coupled with state-of-the-art hardware, allow for efficiency and flexibility in operating numerous services simultaneously - including, but not limited to: toll-free numbers, conference bridges, voicemail platform, automated dialing applications, online meetings and faxing. Each day we route thousands of inbound and outbound calls through a host of phone companies. With these existing relationships, we’re able to build new applications quickly and efficiently. Furthermore, since our platform is 100% “custom built” using industry proven components, we have the flexibility to customize our applications to fit the exact needs of our clients. That is, we’re not limited by any one vendor’s feature set nor simply reselling someone else’s framework.